Come shop at the Byram Hills PTSA…Spring Boutique! 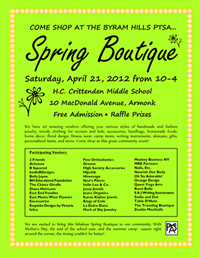 Saturday, April 21, 2012 from 10-4, H.C. Crittenden Middle School, 10 MacDonald Avenue, Armonk. 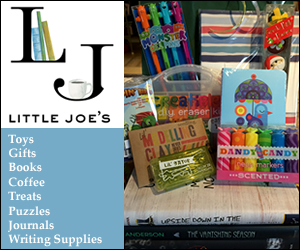 Free Admission Raffle Prizes. We have 40 amazing vendors offering you various styles of handmade and fashion jewelry, trendy clothing for women and kids, accessories, handbags, homemade foods, home décor, floral design, fitness wear, camp items, writing instruments, skincare, gifts, personalized items, and more. Come shop at this great community event! Participating Vendors: 2 Friends, Arbonne, B Squared, bedfoRDesigns, Bella Jayne, BH Educational Foundation, The Chintz Giraffe, Diana Heimann, East End Foodies, East Meets West Flowers, Excessorize, Exquisite Designs by Victoria, felisa, Fine Orthodontics, Groove, High Society Accessories, Hipchik, Hivernage, Ilyse’s Pieces, Indie Lee & Co., Jazzy Jewelz, Jnana Organics, Karen Klafter Jewels, Kings of Cole, La Dolce Dana, Mark of Sky Jewelry, Monkey Business NY, MRE Partners, Nails, Etc., Nourish Our Body, Oh So Adorable!, Orange Design, Quest Yoga Arts, Romi Belle, S & J Writing Instruments, Stella and Dot, Table D’Hote, The Traveling Boutique, Zookie Meatballs. We are excited to bring this fabulous Spring Boutique to our community. With Mother’s Day, the end of the school year, and the summer camp season right around the corner, the timing couldn’t be better!